We will do our best to describe any noticeable flaws. WHAT A SUPER PAIR OF WORK PANTS! ~FEATURE A 4 POCKET DESIGN. TOTAL LENGTH: 41 1/4". Rugged cotton cords, brass zipper, the rear belt loop is broken on one end, bootcut flare. 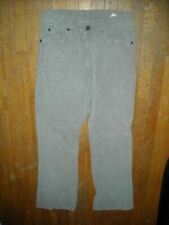 These grey jeans are in good used condition, no stains, odors, tears, or holes. Inseam: 29". Rise: 16". COLOR: TAN. LENGTH (INSEAM): 29. WIDTH(WAIST): 29. If you are very particular, then used clothing may not be for you. INTERNATIONALLY ASK FOR A QUOTE. Perfect color, late 70s era, no thinning. 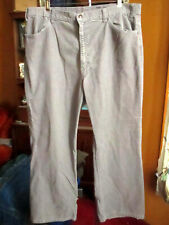 Vintage 70s Wrangler Scovill Light Gray Denim Mens Jeans Sz 34X29 Made USA. Shipped with USPS Priority Mail Flat Rate Envelope. With a skosh more comfort. gray in color. Condition: These jeans look amazing with perfect looking minor little rugged looking wear here and there, just enough to give them a perfect look and feel. Inseam: 29. 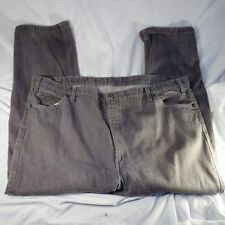 OLD SCHOOL PANTS. NICE PANTS! DON'T LET THESE GREAT PANTS GET BY YOU! These are our standard rates. Rates will be higher for large sizes or extra heavy jeans. U.S.A. CANADA OTHERS. AS IS ONLY. ITEM IS SOLD.